Today we are sharing a draft of Scotland’s Second Action Plan on Open Government to hear people’s views on it before it is published. The Action Plan includes 5 proposed commitments on improvements to openness, transparency, involving people, and accountability of public services. The Action Plan details what the Scottish Government and partners are planning to do over the next two years. It details why these changes are important, who they will work with to deliver this and when they will do this by. This Action Plan tells the story of Open Government in Scotland, the ambitions behind it and where it sits in wider context. The Action Plan has been produced in partnership by the Scottish Government and the Scottish Open Government Network. We would welcome comments on this draft. Leave a comment on the blog site, or email comments to the Scottish Government Open Government Team ingage@gov.scot by the end of Tuesday 27th November, when this period for public comment will close. Thank you for your interest and reading the draft Action Plan. To make it easier to read, we’re sharing the Draft Action Plan which includes summaries, and a seperate document with the full detail of all the commitments. Why are we sharing a draft? Because this Action Plan has been co-created with many people involved, we wanted to share a draft of the document before it’s officially published. This includes sharing it with the people who came to public discussion events we held over the summer to get their ideas, and the Open Government Network made up of organisations and individuals. We hope there won’t be many big changes to be made at this point, as we are nearing completion and we have been working with the Open Government Network and partners to work out the detail of these commitments. The Action Plan is based on ideas we heard from the public. Where have the ideas come from? 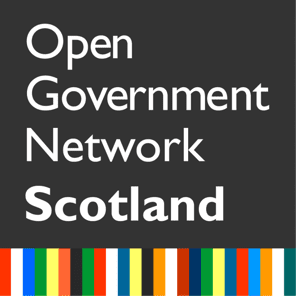 The ideas came from the public and have been developed by the organisations and individuals involved in Open Government Network, members of the Open Government Steering Group, public service regulators, academics, and the policy teams at the Scottish Government. This work has been done in partnership. How did you develop the ideas? Along with the public discussions and ideas, we have had a Steering Group meeting to get the views of the members from civil society and government. We have worked in pairings of government and civil society to develop specific actions. We’ve taken on lots of useful feedback from civil society and tried to improve the commitments based on their input. Co-creating, negociating and developing commitments is not an exact science so it was difficult to predict timings, put in place a partnership process and to communicate on-going negociations. This was the first time working in this way for all of us, so we will be reflecting on the process to try to improve it for next time. Find out more about what we’ve been doing to develop this Action Plan over the last couple of months. We will listen to and try to incorporate comments in re-drafting this Action Plan, before submission to Scottish Ministers for approval and submission to the Open Government Partnership officials. We will then publish this officially, and explore other more accessible formats, towards the end of 2018, early 2019. We will be working closely with the Network to deliver the commitments outlined over the next two years so there are plenty of opportunities to get involved. Anyone with an interest can join the network and become a member. It’s free and you can be involved as much or as little as you like. We would welcome views and comments on this draft Action Plan. Leave a comment on the blog site, or email comments to the Scottish Government Open Government Team ingage@gov.scot by the end of Tuesday 27th November, when this period for public comment will close. Thank you. Dear Niamh, thanks very much for the opportunity to comment on the draft Open Government Action Plan for 2018-2020. It will now be a question I think of continuing with these over the next 2 years. Hi Bruce, thanks for the comment and offer of help. That would be great, will email to discuss if the offer still stands. The deadline for comments is end of today, and we will provide responses to comments recieved. I have emailed a document with my observations. Thanks for all your hard work on this – it’s been great to see collaboration done so well and openly. My comments are based on the summary doc only – I’ll try and read the full one before 27th! The simplicity of the way each commitment is articulated i.e. what issue are we trying to address, what are we going to do and how will this activity address the issue is great. I know FOI is covered more in depth elsewhere but I think the document could be more overt about the important roles that FOI and the Local Governance Review and the Lobbying database play in Open Government; and specifically call for more explicit links/reference to be made in between all 4 ‘things’. In addition to the financial decision making and accountability threads I’d really like to see a commitment on unpicking how decisions are made and identifying points of influence within the process and how to influence these. Are there any measurements or indicators of impact/success? (apologies if these are only within the in depth document) A natural continuation of the what are we trying to address – what will we do – how would this address the issue is a 4th: ‘how will we know if we’ve succeeded’ and would round the work off neatly. One final minor point is that the actions in Commitment 1 and ‘how will that solve the problem’ only link to the new powers / SNIB / Scottish Exchequer and don’t – I feel – adequately demonstrate what you’re going to do to address the first part of the commitment on giving more information to the public on how the Government uses public money. Overall I think it’s really succinct and understandable…but a few things to tighten up, particularly the one about measuring impact/success. Thank you for ‘pre-sharing’ this. I hope to find mental energy to comment on the content in the next few days – is there a deadline? Meanwhile, I suggest that some the following illustrations are too small: foot of page 2, top of page 8, page 23, page 27 (both photos), page 28. I’d be happy to give a second draft and ex-publisher’s once-over. In 2016 Scotland became a member of the international Open Government Partnership. This blog tells the wider story of the Scottish Government’s OGP journey.